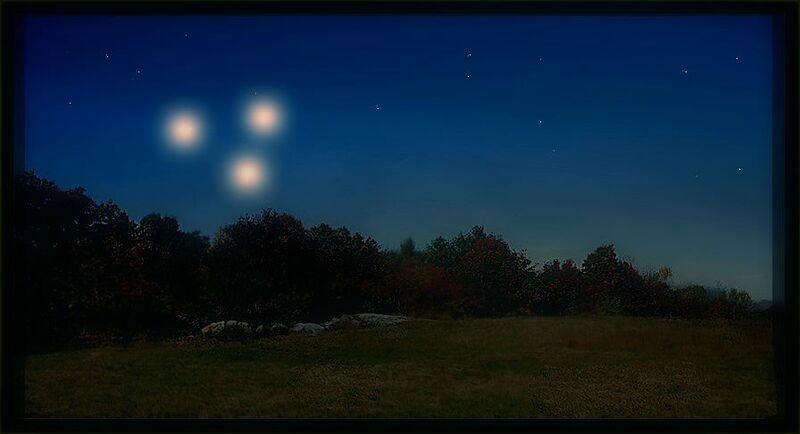 MY NAME IS LINDY TUCKER AND I HAVE HAD SOME INTERESTING UFO SIGHTINGS ACCOMPANIED BY SOME VERY UNUSUAL SOUNDS OVER THE YEARS STARTING IN THE MID 1970’S. 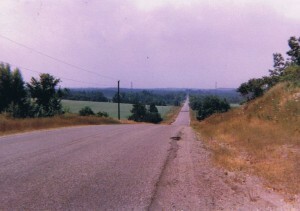 JUST AS I WAS GETTING READY TO WRITE IT OFF AS A SERIES OF UNUSUAL EVENTS IN ONE LOCATION, I WAS INTRODUCED TO SEVERAL MORE CASES IDENTICAL TO MINE ACROSS AREAS OF CANADA AND THE UNITED STATES FROM 1960 TO THE 1990’S. THE US AIR FORCE WROTE THESE CASES OFF AS BEING THE SOUNDS OF A SAW WHET OWL, BUT EXTENSIVE RESEARCH ON THESE CASES HAS DISPROVED THAT. THE SOUNDS HEARD DURING UFO SIGHTINGS SOUND SIMILAR TO THIS SIX INCH OWL, BUT THE STORY GETS BETTER…..MUCH BETTER. BELOW IS A PICTURE OF SAW WHET OWL. Although I published many articles and did many radio interviews over the years, I kept some parts of my story hidden from the public eye. 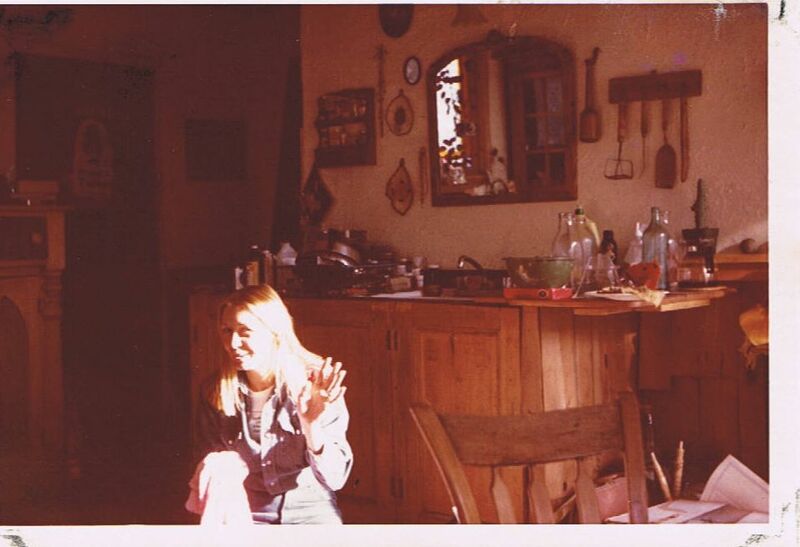 In 1975, when my encounters started, things were a lot different back then, you didn’t just come out and share openly without being looked at as some kind of kook. I had enough trouble with my neighbors and friends and family, so I went to the investigators, the scientists, the doctors and engineers with my story and accumulated a lot of information and contacts along the way. 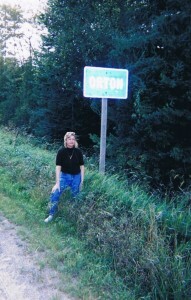 Here I am a few years after my contacts and sightings, standing by the ORTON road sign. Here’s the road going down to Orton. I once saw the “lights” down in the valley going home one night. ORTON was just 2 miles south of MARSVILLLE, Ontario……I often wonder if these towns got their weird names from the settlers who moved there a couple hundred years before I did. What was interesting is that a lot of the local townspeople saw and heard what I saw and heard, and even had a couple of close encounters! 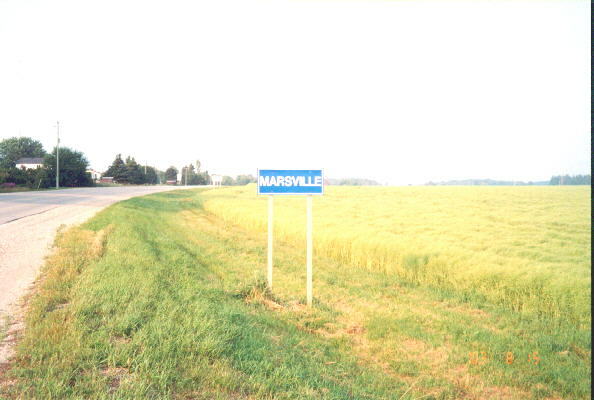 So did the residents of Marsville. I called out to my husband and neighbor who were upstairs watching TV, and we all watched them for about 20 minutes, saying “What IS that?” Then they slowly fused together into ONE and BLINKED OUT. I didn’t get that feeling again for another week or so. It happened again around 7:30 pm, this time while I was washing dishes. I just grabbed a tea towel and stepped outside and there were FIVE of them this time……dancing, and darting about in angular and triangular movements…splitting up, breaking up, morphing into SEVEN of them. They appeared to be white, green and orange. A little light show. I was surprised, then delighted…I had “new friends”. This was to be the beginning of my “contacts” with this AERIAL PHENOMENA, as I always knew subconsciously when “they” were coming. I could even predict the TIME. This continued for a few weeks until the night of April 26th, when an unusual SOUND started up, coming from the back yard. It was loud and it had a high metallic pitch to it, like submarine sonar. It was so loud you could hear it inside the house, with the doors and windows closed. My neighbors started making fun of me…Lindy is “seeing lights and now she’s hearing noises”, so I told them to just wait, I’d call them next time I heard it. Below is a picture of my garden in the summer of 1975. We didn’t have long to wait. A month later, on the night of May 19th, my husband and I and our neighbors were sitting in front of a bonfire out in our back yard near the garden. The night was ALIVE with noise and excitement…SOMETHING WAS IN THE AIR. The dogs were all barking, the roosters were crowing and the cows all around us were bawling………I remembered saying I felt like I was in the middle of a cattle drive. 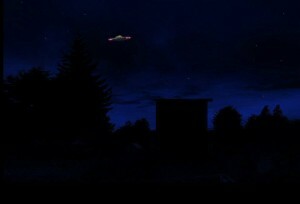 We all went back to our homes around 11 pm, but an hour later as I was taking out the garbage, I heard those strange metallic beeping sounds again. So I called my neighbors up and they all came back. 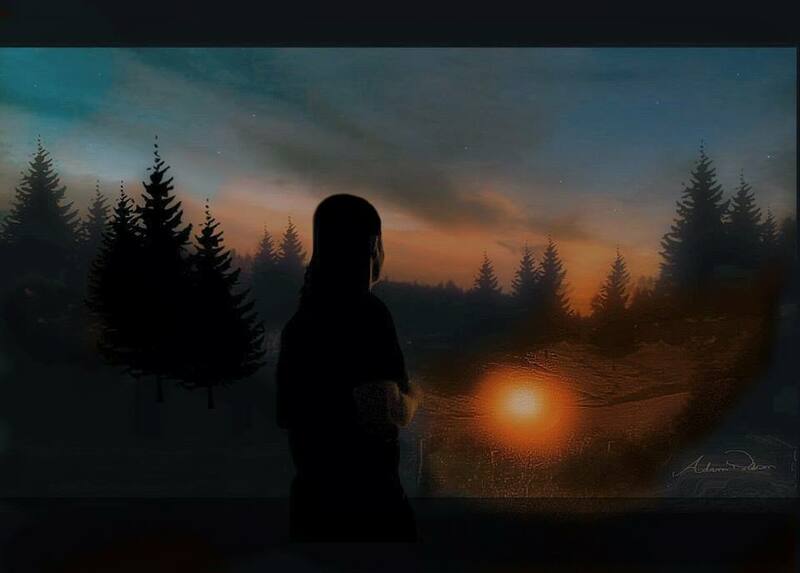 As we stood there behind our house, bewildered by this loud pulsating beeping sound, we were each seeing flashing red lights in the woods when all of a sudden one of them ROSE STRAIGHT UP and made a 90` turn and started to come towards us in an arc. I instinctively ran behind our shed to get a closer look at it as our spotlight was casting all our shadows, and I didn’t want to be seen. So I got the closest look at it. It was a silver rotating disk, about 30 feet across with a soft white dome on top. It had red lights around it’s perimeter, and when I saw that I could COUNT them is when I became alarmed and decided to get back with my neighbors! At that point it was only about 75 feet up and maybe 150 feet away….I could have thrown a stone at it. My neighbors were just as jittery. As soon as we agreed we should all go back into the house, it started to veer away from us. It affected us all in various ways…..for me; it was like sticking my finger into a light socket. Everything I knew, and thought I knew….was turned upside down. I was excited, enthralled, nervous, afraid and completely drained. My knees were weak. I remember going back upstairs to wake my husband up to tell him my story and frankly, I don’t think he believed me. The neighbors across the road…the Adams family didn’t really like the feeling they had ufos in their neighborhood, so within weeks there was a FOR SALE sign up in front of their house and they were gone shortly thereafter. The neighbor next to us was an EMT working in Toronto. Cal was paranoid and was always carrying guns around with him. One night after seeing his shadow in front of him (when it should have been behind him), while stalking these elusive ufos with his rifle, he freaked out and shot up some of the animals in his barn. The next morning he shot our neighbors St. Bernard dog out front of our house. Thankfully we weren’t home at the time. 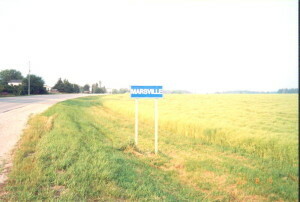 The rest of our tiny town were ready to tar and feather him, so he too, quickly left town and was never heard of again. I was left to deal with these ufos. Not only did they seem to follow us on local night time trips, but my inter-action with them strengthened. 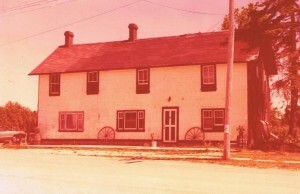 Here’s the old Commercial Hotel in Orton before we bought it and fixed it up. This was the way the old Orton Hotel looked like when we first arrived. It was built in 1864 and was known as the Commercial Hotel, so it had quite a history. Half of it had burned down but it had a workshop so we set about fixing it up inside and out. The photo below was taken at the turn of the century, when local farmers and tradesmen brought their goods and livestock to Orton to put them on the railway train to Toronto, Ontario. 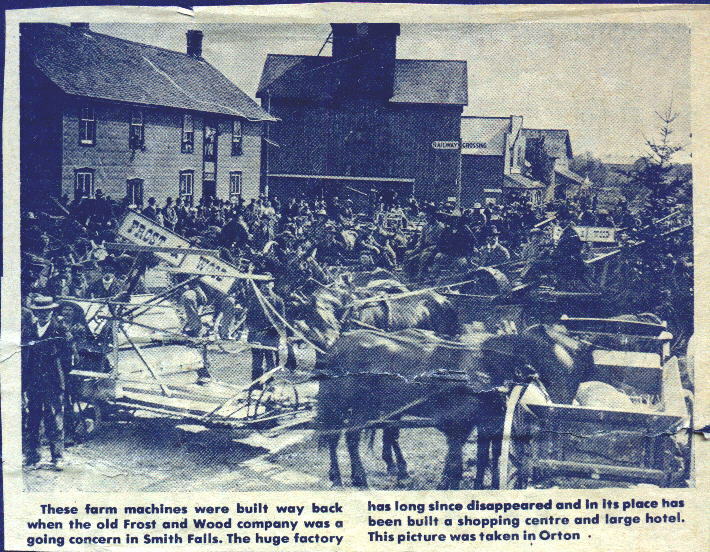 Here’s a photo of the town of Orton, Ontario at the turn of the century. I made enquiries to the local newspaper THE ERIN ADVOCATE if there had been any other sightings in the area (there had been) but I would not allow the publisher to write up my story for another year. I didn’t want the publicity. 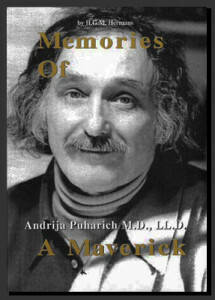 Around that time, a friend gave me a book about this doctor in New York State by the name Dr. Andrija Puharich who was having ufo contact with the famed psychic Uri Geller from Israel. The book was called “URI A Journal of the Mystery of Uri Geller” (anchor Press 1974). 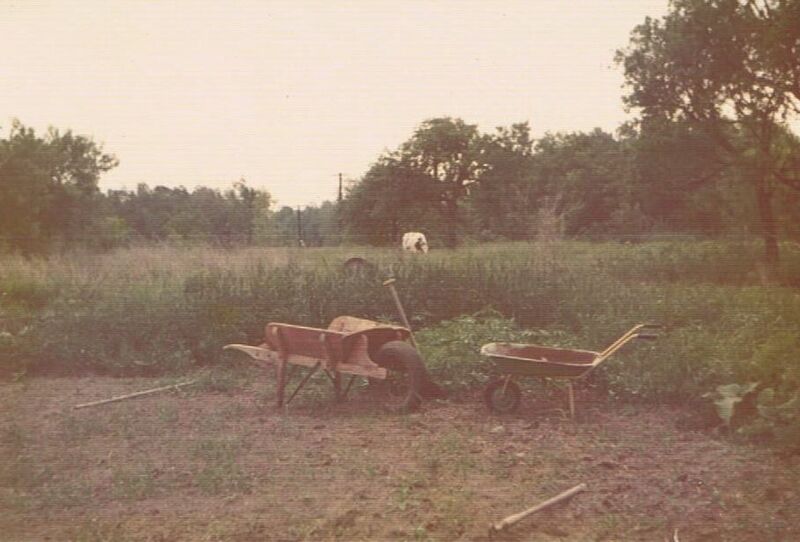 Since Dr. Puharich was speaking at Convocation Hall in Toronto and I had read that he and Uri were getting odd cheeping sounds on Puharich’s property in Ossining, New York; I decided to go and meet with him. Little did I know that I would work with this doctor for the next 20 years of his life. Within weeks of meeting him, Andrija came to visit us in Orton. I can look back on this now because I kept journals at that time, and whenever I had contact with Andrija, MY contacts increased. It was like we were linked. One night when he had called the house, my girlfriend Julie and I were outside mesmerized by this bright star that looked like the Star of Bethlehem in my backyard. It’s brilliance took up a full 60` of the horizon, and we were out there for over an hour (maybe even two hours) watching this little red dot zipping in and out of it. When we returned back to the house, both Julie and I had splitting headaches. We thought it was odd. It wasn’t until weeks later while going through my journals did I note that Andrija had called earlier that evening. 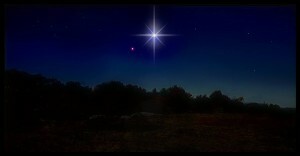 Illustration below of this “Star of Bethlehem” we observed for a couple of hours, with this odd red light zipping in and out of it. I continued to live there another couple of years, experiencing these dancing lights, and occasionally the beeping sounds with incredible effects experienced by those in close proximity. Along with the phenomena came electromagnetic effects, displaced time, missing objects re-appearing in different places, odd interferences on my phone line and periods of PK (psychokinesis) and precognition. One night as I stepped outside the back door, I was approached by a large ball of orange light that stopped me in my tracks. It was beautiful and mystifying. It felt intelligent, and dangerous. I didn’t move an inch. And there’s where my memory fades. For the full story, you can read any of my articles under RESEARCH. Illustration below. Thank you for your interest in my research. I am currently working on a book detailing 40 years of searching for the truth of this phenomena. If you would like to contribute to the unraveling of this mystery, I am currently accepting donations to make this a reality. Please click the link below to donate.